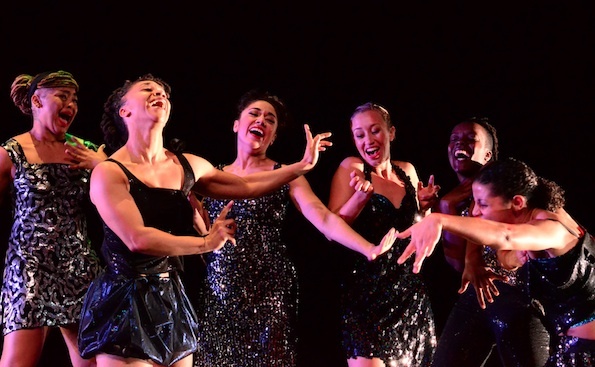 Brooklyn-based dance company Urban Bush Women came to the Peach State in January as part of its 30th anniversary tour, which is also visiting Seattle, Miami, Chicago, Portland and other locations this year. Since bursting onto the dance scene in 1984, UBW has used distinctive dancers sporting their own individual look and swagger to carry its message, which typically involves carefully selected music, text overplayed, spoken word and contemporary dance (a mixture between West African, early jazz, tap and modern dance). This performance is no exception, being wonderfully curated to reflect all these elements and to serve as a retrospective into both the company founder’s origins and as a tribute to many African American leaders. The mostly-female ensemble presented three works for Saturday evening’s program: Hep Hep Sweet Sweet, Give Your Hands to Struggle and Walking With ‘Trane, Chapter 2. Hep Hep Sweet Sweet is a fantastic choice for the opening work, as it immediately brings a handful of dancers onto the stage, feet blazing trails all across the floor as they stomp and jump in sparkles and with bare-footed abandon. Their energetic and smiley movement immerses viewers into the jazz culture’s intoxicating vigor and helps place the time frame for the work, which choreographer and company founder Jawole Willa Jo Zollar notes through a pre-recorded narration was her childhood growing up in Kansas City as a product of the Great Migration. UBW dancers in “Hep Hep Sweet Sweet.” Photo by Rick McCullough. As the work evolves, this lively section dissipates and a more harrowing depiction of racism and hardship appears. Zollar’s work showcases how jazz music was her family’s refuge, their delight, their escape and also, their frustration. She describes her family as Texans who moved to get away from the injustices of the Jim Crow South only to find the same injustices in another form in the Midwest. One vivid moment that stands out is dancer Tendayi Kuumba’s solo, which surprisingly has her begin singing and then “scatting” (when a jazz singer says or sings phrases of nonsensical words.) In a strong performance, Kuumba shifts back and forth between laughing and panicking, scatting sounds until suddenly she spits out the word “can’t” and later, after many deep breaths and more scatting, “can’t go back.” This portrays the deep desperation felt in those times, when black families fought hopelessness and were trying to make new lives for themselves only to find fresh difficulty. 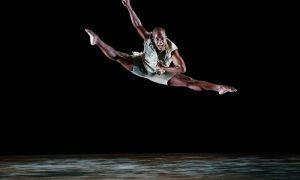 After more exceptional singing from dancers and various solos and duets strung throughout, Zollar’s work wraps up when the company hit their same poses as from the conclusion of the first section. However, in a strategic choice, Zollar has the dancers fade and deflate, presenting a restless dissatisfaction in the midst of their resilience. I personally like that Zollar didn’t try to wrap up her work with a bright, pretty bow. It felt raw and real, which felt like a better way to honor her family’s story and that generation’s struggle. After an intermission, the program presents a shorter solo set to excerpts of “Hands Singing Song.” Give Your Hands to Struggle is another tribute to the courageous dedication of African Americans and other civil rights leaders who worked for equal rights for blacks or died as victims of this often skewed society. 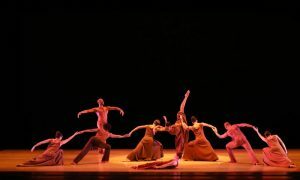 It reminds me of Alvin Ailey’s signature solo Cry, as it has the dancer centerstage in a white dress in an emotional and heartfelt homage. A list of names are spoken throughout the work in memory of their contribution, including historic leaders like Harriet Truman, Rosa Parks and Martin Luther King Jr., as well as newer victims of racial profiling, Eric Gardner and Michael Brown. UBW in “Hep Hep Sweet Sweet.” Photo by Rick McCullough. The show closes with Walking with ‘Trane, Chapter 2, inspired by John Coltrane’s seminal jazz work “A Love Supreme” and choreographed by Zollar and Samantha Speis in collaboration with the company. 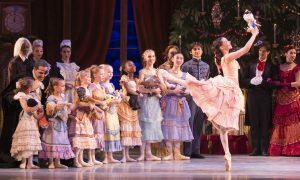 It brings new faces onto the stage, including the show’s only male dancer. With more singing and some of the most technical choreography of the evening, the piece exhibits a new lightness, as well as a graceful reverence, cueing Coltrane’s spirituality. Even when low to the ground, dancers seem to direct their focus upward, suggesting a higher power. Throughout the evening the audience also has the pleasure of enjoying live music, with musician Lafayette Harris Jr. playing piano for Hep Hep Sweet Sweet and then Walking With ‘Trane, Chapter 2. This performance was truly a compliment to the three decades Zollar and her company have graced America’s stages. Photo (top): Urban Bush Women in Hep Hep Sweet Sweet. Photo by Rick McCullough.